So, you need to find Mizzou off-campus housing? Well, you’re in luck. In recent years, declining enrollment and an excess of available houses in downtown Columbia, MO have turned the Mizzou off-campus housing rental market into a friendly one for students. You have options and competition for student housing in Columbia isn’t what it once was. That doesn’t mean the process is that much easier though. That’s why Rent College Pads is a student housing marketplace focused on helping college kids find, compare and decide on a pad. We offer a variety of tools specifically suited to Missouri student looking for houses for rent in Columbia. If you’re also looking for roommates check out our Facebook integrated roommate finder where you can see other renters looking for housing. Filter our Mizzou student housing options by bedroom count, bathroom count, amenities offered, pet allowance and more. And lastly, check out our University of Missouri campus guide to learn more about rent prices, popular areas to live in Columbia and things for students at the University of Missouri to do. For years, as soon as the fall semester began, so did the hunt for student housing near Mizzou. But things have changed a bit, depending on what you’re looking for. Homes for rent in Columbia, MO are still the priority for student renters and draw the most attention during the first semester. Students start pre-leasing houses - primarily in the East Campus area east of College Avenue and west of 63 South and the North Central neighborhood between Mizzou and Columbia College - in mid-October and November. But if you’re looking for an house in downtown Columbia, you’re a beneficiary of the recent enrollment decline. In the past 10 years, there was a rental boom near the Missouri campus and you’ll find tons of options in the downtown neighborhood. You’ll likely be asked about your renewal intentions in October or November, but you can be a bit more leisurely with your search. Iniversity of Missouri off-campus housing will be available for pre-leasing into the second semester. And if you want a studio or one bedroom in Columbia, you can probably wait until later in your second semester to lock down a place. Unfortunately, you’ll certainly have to pay a premium for all that space and privacy. Compared to other cities, houses for rent in Columbia, MO are reasonably priced and larger communities are a bit more expensive. The overall breakdown of rentals is split pretty evenly, but as we noted before, you’ll just need to start searching earlier if you want to enjoy the savings benefits of living in a house near campus. With so many choices, it can be difficult to know who is the best person or group to rent from. We compiled reviews and feedback from across the web to bring you this list of the best providers of apartments near Mizzou. The Lofts of Columbia offer one and two-bedroom luxury student apartments in four different apartment complexes, so anyone is bound to find a pad that suits their needs. For over a decade, Hawks Management has been developing and managing some of the best apartments in Columbia! Their four locations are conveniently located near the Mizzou campus. Round up your friends and grab a place at Rolling Rock Townhomes. Specifically designed for students, they are the closest townhomes to the University of Missouri campus! The Kitty Hawk Apartments are centrally located, so getting anywhere in on or off campus is a breeze! Residents can choose from a variety of floorplans ranging from one and two-bedroom units at their Kitty Hawk location to three-bedroom townhouses at their Parker Street Townhouses. Choose The Den Columbia and live a life of luxury! This off-campus student oasis has two and four-bedroom units in downtown Columbia that come fully furnished, so you can skip the heavy lifting. Locally owned and operated, The Pointe at Rock Quarry Park is a townhouse community specifically developed for Mizzou students. All of the townhouses have four bedrooms and 4.5 baths. Calling all graduate students! Sorry, undergrads, this one isn’t for you. The Broadway Village Apartments is a Mizzou graduate student housing community that maintains a quiet environment, away from all the hustle and bustle. Mills Properties has been setting up students with their perfect pads for over 30 years! Mills Properties develops, builds, and manages all of their properties, so you can trust them to be there every step of the way. Callahan and Galloway was founded over 20 years ago with the intention of being the best locally owned and operated property management company near Mizzou! A family run business, Goran Rentals has been setting up University of Missouri students with off-campus housing since 1984! With all those years of experience, you can bet these guys know what they’re doing. 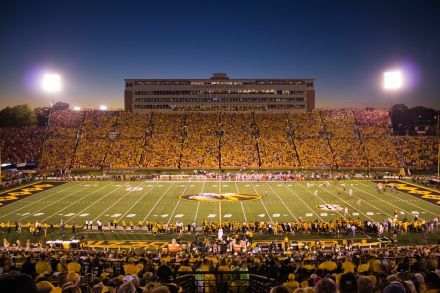 The University of Missouri is full of sports, good friends, good food, and plenty of on and off-campus activities. Located in Columbia, Missouri, Mizzou is one of two prominent schools in the area (Columbia College being the other) and is home to over 25,000 undergrad students. It’s well known for its journalism school and is the flagship school of the University of Missouri system. The University of Missouri Outdoor Adventures program is great for students who want to be engaged in outdoor activities. At the start of each school year, students can attend RecFest to check out all the center has to offer. Students can use the fitness facility, pools, and rock climbing wall, as well as being able to participate in intramural sports. The Haunted Trail is a fun event when the Foster Recreation Center transforms into a spooky haunted house every October. Hundreds of students attend for hot cocoa, s'mores, and more! Students can rent canoes, kayaks, camping equipment and more. There are many parks around the Columbia area where you can head off-campus and take in the spectacular views and enjoy some time out of the city and away from classes! If you don’t have much time, the University of Missouri Botanical Gardens is a great place to start and it’s right on campus. Like many universities, sports are huge at Mizzou (especially football). Tiger pride is evident all around Mizzou so grab your black and gold gear, hit up a tailgate and head to a game to support your school! Some other popular events around campus include Mizzou After Dark, which is an organization that hosts weekend activities like dances, crafts, and obstacle courses on-campus. Head off-campus and explore what Columbia has to offer! 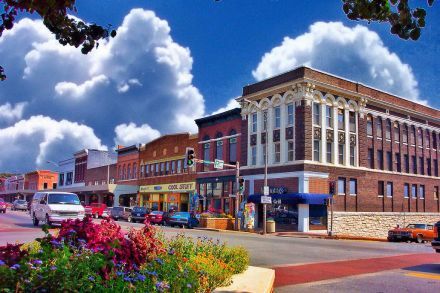 Many students enjoy going to nearby Downtown Columbia, or “The District,” to eat, drink, shop, and roam the streets. Many events are held here throughout the year like Restaurant Week, Frightening Friday, and Living Windows Festival. 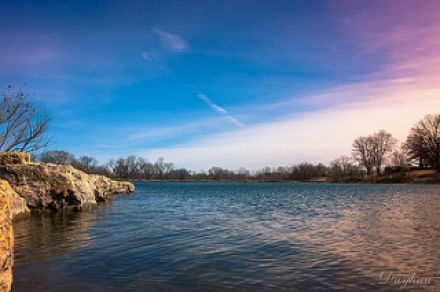 There are also several parks in Columbia like Rock Bridge Memorial State Park, Stephen’s Lake Park, and the Shelter Gardens where you can go to get away from the stress of classes and hike or bike the many trails. As its name suggests, East Campus is the neighborhood located just east of the University of Missouri. This is a great location for students who don’t want to travel far to get to class, as it’s an easy walk to and from campus. This area of town is primarily residential is home to many historic homes and apartments that are mainly populated by the college crowd. 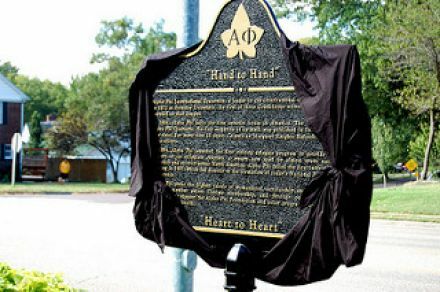 In this neighborhood, you’ll also find Mizzou’s Greek housing. Situated just west of Downtown and the University of Missouri is the quaint neighborhood of Old Southwest. Often described as a city within a city, Old Southwest is a section of town with tree-lined streets and charming homes built in the early 20th century. Much of this neighborhood is inhabited by homeowners, but finding rental properties is possible and isn’t a far commute to Mizzou. 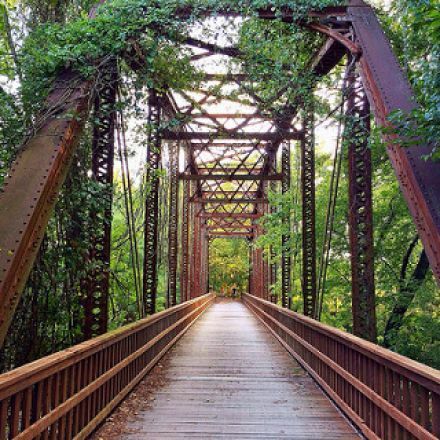 It’s a great neighborhood for students who enjoy nature and are looking to stay out of the “college scene.” Both John A. Stewart Park and the MKT Trail can be found in Old Southwest. Restaurants, bars, shops, housing and more make up The District, Columbia’s happening downtown scene. Located a short distance from the University of Missouri, students can get to classes in five minutes by bike and under twenty minutes by foot. Those who prefer an apartment over a house will want to check out The District, as there are much more apartment complexes in this area compared to other neighborhoods surrounding the University. Step outside your door and you’ll bein the heart of it all; you’ll have access to numerous popular bars and restaurants, and running errands is a breeze. Throughout the year, The District plays host to several events, like a weekly Farmers Market, sidewalk sales, and concerts! With 50-square blocks and six different neighborhoods (The Strollway, North Village Arts District, Flat Branch, Government District, West End, Avenue of the Columns) anyone is sure to find a spot that suits their style. Some of the most desirable student housing in Columbia is located downtown as well. Often called one of Columbia’s “best-kept secrets,” the Benton-Stephens neighborhood is located northeast of the University of Missouri and is within easy walking distance to campus, so there are a lot of Mizzou apartments located in this neighborhood. Benton-Stephens is one of Columbia’s oldest neighborhoods and houses the “Most Notable Properties” according to the Columbia Historic Preservation. This neighborhood has more long-term residents, but if you’re a college student looking for a quieter environment, this might be the neighborhood for you. One of Colombia's largest Parks, Stephens Lake Park, can be found in this neighborhood. This popular attraction is a fun place to gather on the lake and enjoy outdoor activities like disc golf, fishing, archery and more! Described as a “welcoming” and “old-fashioned” neighborhood, the Grasslands neighborhood is located southwest of the Missouri campus. Throughout the year, residents come together to enjoy events like the Easter Potluck and July Fourth celebration. This area of town is well liked by students and families alike due to its proximity to the University of Missouri, Downtown, easy access to the MKT Trail and Memorial Stadium. Being steps away from Memorial Stadium makes the Grasslands a popular tailgating spotl before heading off to cheer on the Tigers!